The building of the Student Club was constructed in the period between the two World Wars, with plans based on the study drawn in 1927 by the architect E. Lazarides. 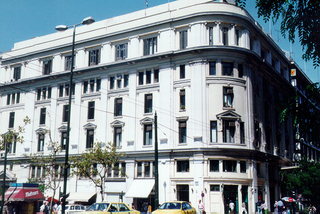 Today, it belongs to the National and Kapodistrian University (Bequest of Papadakis). The edifice is an eclectic one has a characteristic curve on its corner. It is five-stories high and its base-body-crowning parts are distinctly separated between them by jutted cornices. Another characteristic element is the different style of the openings at the stories. Today, the building houses shops and the students' theater in the ground-floor and the first floor, the students' restaurant on the second and third floors, and offices on the last floors.